I tried not to approach this show with high expectations – for fear I would be left disappointed. After all – this production is trying to replicate my favourite movie of all time – Singin in the Rain! Because of this movie, I developed a love for dance and broadway musicals and realised early on that Gene Kelly was the ultimate male dancer and performer that has yet to be matched. Happily, the opening night of Singin in the Rain (produced by Lunchbox Theatrical Productions, Michael Cassel Group, David Atkins Enterprises and Dainty Group) in Sydney at the Lyric Theatre delivered a simply delightful performance that left the entire audience toe-tapping, whistling and with a warm smile on their faces. I was not disappointed in the slightest! In case you don’t know, Singin in the Rain is a stage version of the famous 1952 MGM movie musical that showcases great singing and dancing in true golden Hollywood style. Set in 1927, it tells the story of the first Hollywood musical when the ‘talkies’ replaced silent movie and left some of its stars behind. It centres on the four main characters of Don Lockwood, Kathy Selden, Lina Lamont and Cosmo Brown as they try to salvage their new film ‘The Duelling Cavalier’, while, of course, Don and Kathy fall in love. There’s romance, comedy, dancing, singing, blackmail, justice and fun. It cemented Gene Kelly (Don), Debbie Reynolds (Kathy) and Donald O’Connor (Cosmo) as true Hollywood icons. In Sydney, Grant Almirall plays the lead character of Don, Gretel Scarlett plays Kathy, Jack Chambers plays Cosmo and Erika Heynatz plays Lina. Almirall has replaced drawcard Adam Garcia for a few months due to an injury. This production perfectly respects the original movie by staying on script and re-creating every famous song and scene beautifully. The exciting choreography, by Andrew Wright, is new and original while still representing classic broadway style jazz and tap and touches of ballroom. The entire ensemble and leads are flawless, energetic dancers and it must be a dream-come-true for them to be performing such beautiful routines in this classic show to some of the best tunes ever written. Singin in the Rain features some of the best choreography and dancers I’ve seen on stage in a long time. Rightly, it is up for Best Choreography in a Musical at this year’s Helpmann Awards. Standout performances from Singin in the Rain are delivered by Jack Chambers and Erika Heynatz. It’s no wonder they are also both nominated for Helpmann Awards in their supporting roles. Chambers makes the comedic-character of Cosmo his own. Not only an incomparable dancer, Chambers’ slap-stick physical comedy and vocals confirm he is a true star of the musical theatre stage. The surprise performance for me was Heynatz as the nasally, whining, manipulative Lina Lamont. Heynatz hilariously captures the essence of Lina and even manages to belt out a song in her character’s annoyingly high pitched voice. She is a riot on stage and I hate to think how her voice must feel after every show! Admittedly, I was disappointed not to be seeing Adam Garcia play Don Lockwood in Sydney and, to my distraction, I kept imagining what he would be like on stage. Having said that, stepping up into the role made famous by the one-and-only Gene Kelly is never going to be an easy task – regardless of who you are. Grant Almirall has performed this role in other production in South Africa, New Zealand and Hong Kong. And it showed. He was faultless in all aspects of his performance. In particular, his superb dancing conveyed the tenderness and joy of Don’s character. It takes a true showman to handle the subtleties of the various dance styles and routines. And when he came to the signature song and dance in the ‘actual’ rain (yes, it rains on stage!) I can guarantee every person in the audience had a grin from ear to ear and felt all warm and fuzzy. The scene was pure theatrical magic. Almirall did as good as could be expected considering the situation and expectations of the role. 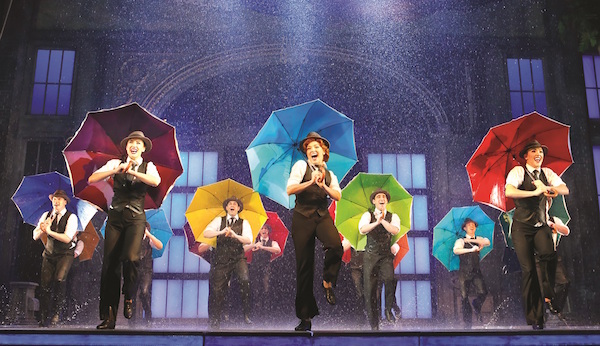 Overall, Singin in the Rain is a fantastic production that lovingly pays homage to the original movie. It’s a great night out that reminds us of the magic of theatre. You will leave happy and for a few hours Singin in the Rain will make you forget about your troubles. Try not to miss it.